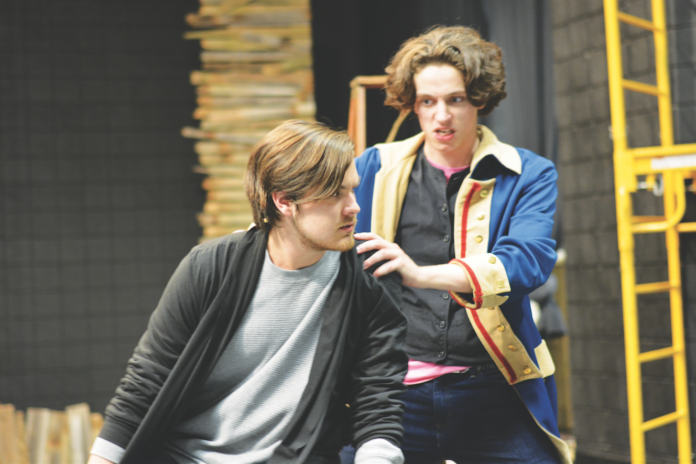 The theatre department is giving students a chance to experience the origins of a childhood favorite with Peter and the Starcatcher come April 26. Based on the 2006 novel ‘Peter and the Starcatchers’ written by Dave Barry and Ridley Pearson and adapted to stage by Rick Elise, the show projects a backstory about the main character, Peter Pan, and is considered a prequel to the original story by J. M. Barrie. Play Director Rebecca Faulds-Howard is guiding students through this magical universe through the many practices the cast has each week. One of the ‘new’ faces, not seen in the original piece is the Starcatcher Lord Leonard Aster, who will be brought to life by Freshman Bryce Neel. “Lord Leonard Aster is a victorian gentleman from the late 18 hundreds in England. He is a loyal subject to the queen, and a devoted father his daughter Molly, because her mother passed away when she was only six years old,” said Neel. “I am also a Starcatcher, who are people who duel on earth and protect the world from the powerful starstuff, which is basically compared to the pixie dust in the Peter Pan movies. ‘Starstuff’ is the term used to describe the pieces of stars that fall from the heavens and contain powerful magical properties, which are protected by the Starcatchers. It plays a huge part on the show, since it is the reason for Peter’s everlasting youth and all the magic present in Neverland. “At the end, Peter falls into a huge lake of pure starstuff, and it changes him, and he doesn’t recognize that it changes him, but it makes him be a boy forever,” said Delk. Neel defines Starcatchers as ‘people who protect the world from starstuff getting in the wrong hands’ referring to the antagonist of the story, the malicious pirate Black Stache, played by freshman Ethan Beam. The name Black Stache might not sound familiar for those who know Peter Pan’s story, but since this is a creation story, the pirate also becomes one of the most famous characters of all times. “Through character development and through the story, he becomes Captain James Hook.” said Beam. Peter and the Starcatcher will be on stage at Jean Brown Theatre Apr. 26-30 at 7:30 p.m., Wednesday through Saturday and 2:00 p.m. on Sunday bringing a close to the 2016-2017 theatre season.